As many of you guys know, I've got two youtube channels now, both of which I update with new content weekly. With all that uploading I was gettin' a little confused about where everything was, so I decided to create some playlists for both. Obviously they'll be accessible on my actual channel sites, but I thought that listing them here would also serve as a point of reference for anyone who might be interested. There are definitely going to be some repeats among the lists, and also some old videos, but hopefully this'll feel a tad more organized. Collaboween with Torrinpaige & Silvous Plaits! Holiday Series of Hair Ideas, 2011. Vlogs, Tags, Reviews and Monthly Favorites. Tags, Vlogs, Reviews and Favorites! My General Hair Care Routine. One of the requests I get, almost on a daily basis these days, is: How do you take care of your hair? So today, I decided I'd write down my entire routine, that way I'd have a place to direct anyone who asks me again in the future! When I first started my channel a few years ago I only knew the very basics of hair care. From that time to this, I've picked up tons of information whether from books or forum boards, professional hairdressers, and even other "hair" vloggers. But for me, the most useful tips have almost always been learned through trial and error. I think that when filming or writing about anything related to health or beauty its important to remember that we're all truly unique, thus everyone's "routine" will be different. Just to be clear I think that every tidbit I present to you in this entry should most definitely be taken with a grain of salt. I'll do my best to give you guys some links to various resources and by all means if you want to try out a few of the things I practice, go for it! Nothing would make me happier then to hear that something I've written or said has influenced someone else to find their special routine. No matter what you hear me, or anyone else say, never stop questioning or being creative on your own. How to Keep the Hair you have Healthy & Happy! And here's a playlist of videos done by other women who participated in the Long Hair Tag. I wash my hair every single day. I know, I know, every beauty blog out there tells us that this is terrible for our hair, but I can't help it. I have an oily scalp and light colored hair, so when I skip washes it shows. I've been told that there are ways to "train" hair into accepting every other day cleansings and while that sounds great I can't help thinking that there's no way to force our hair to do anything it doesn't want to. We can treat, cut, color and fiddle with it, but ultimately it'll grow out of our heads anyway it wants to. After struggling with my better judgement, I suffered through three months of trying not to shampoo everyday. Eventually I was so uncomfortable I gave up my efforts to conform to all those beauty blogs, and went back to daily washings, which of course, was an absolute relief. Off topic for a moment: Did you know that not washing your hair often enough is also bad? Our hair follicles need space to breathe - if there's too much sebum and dirt blocking the air and circulation you can actually run the risk of hair loss due to stressed out follicles. I still felt a bit guilty though, since I was essentially doing something that is widely agreed upon as being unhealthy. I began to do research on natural shampoos and conditioners in the hope that I'd find products that wouldn't fry my hair. For a time I tried those Lush shampoo bars, believing that because they were vegan and hand made, they'd be a fantastic and affordable alternative to the stuff in my drugstore. Three weeks into using them, I shed half of my hair. It was at this time that I learned about Sulfate Free Shampoo. I don't want to take too much time explaining sulfates here, but I'll give you a brief explanation so that you'll get the gist. Sulfates are a common component in most household cleansers, including dish soap and laundry detergent, and its the stuff that contributes to all the bubbles that we tend to associate with being clean. Obviously, its fantastic at sterilizing our dirty socks and cutlery, but when you apply it to your hair it can be less then gentle. And this is especially so if you wash it everyday as I do. 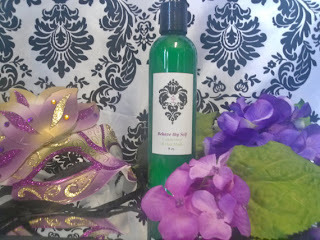 Sulfate free shampoos are designed to clean the hair without stripping it completely of those natural oils that we need. The lather isn't as rich, which can feel momentarily disconcerting, but in the long run its alot less harmful. Not to mention that as soon as I began to use it my hair greatly improved. Of all the things I've done to modify my routine, this has probably been one of the most significant. As of today, my favorite brands in terms of shampoos are Bio Infusion, Burt's Bees, Say Yes to Blueberries and Renpure especially. In fact, that entire line of products is a miracle. I buy most of my shampoos from Whole Foods grocery store, Bed Bath & Beyond's beauty department and also in my local pharmacy. You can, however, order things online if you need to - I like Folica and Sally's. When shopping, make sure to check the actual ingredients on the back label even if the product claims to be sulfate free on the front one. 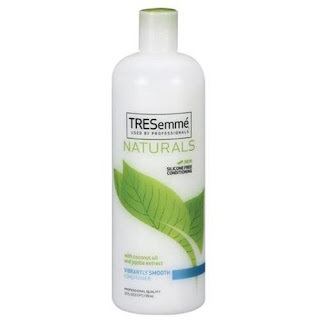 You're looking to avoid both sodium lauryl sulfate AND sodium laureth sulfate. On the occasion I've come across products that have boasted that they're free of one of these detergents, only to find that it contains the other. Not wanting to waste money on a product that had already been purchased, I used it, twice, only to reaffirm my hatred for this company and its gimmicks. With all of that said, now on to how I use the shampoo! I usually use a small amount of product at a time, no more then a quarter size dollop, and I only apply shampoo to the roots and my scalp. After all the oldest and frailest parts of our hair are the ends, and generally speaking they aren't actually dirty. Use the soft pads on your finger tips to massage it in - this is actually an important step in that this motion promotes healthy circulation and blood flow to the scalp, so if you can, take a minute or two to do this. When it comes time to rinse it out, I'll usually gather my hair in a ponytail and hold it out of the water so that the product doesn't run down my length, thus protecting it even further from over shampooing. Stuff can build up on the hair, especially if you use a lot of products like mousse, gel and hairsprays. If you're a swimmer chlorine and chemicals can sit in your hair, as can mineral deposits from hard water in the shower. 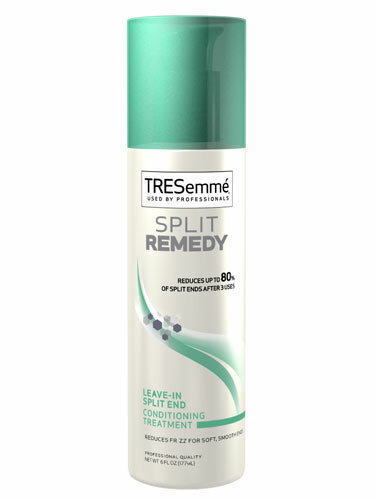 These build ups can cause the hair to appear dull, heavy and limp, and so, a clarifying shampoo can help by removing those deposits and giving your hair a fresh start, so to speak. In general, I really like Bumble & Bumble products, despite the fact many of them contain sulfates. The only downside is that they can be somewhat expensive. I'm a big fan of this stuff, despite the fact that it smells a tad bit medicinal. You may be wondering how often to use a shampoo like this and that really depends on how much your hair goes through on a daily basis. As I said before, if you use many hair products or swim in a pool everyday, you may need to use it once or twice a week. I use mine once or twice a month, and its my opinion that thats sufficient for the average person. 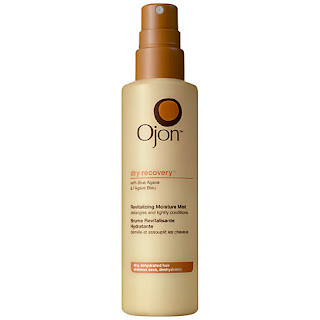 On the occasion I've substituted clarifying shampoo with ordinary, over the counter, sulfate shampoo. 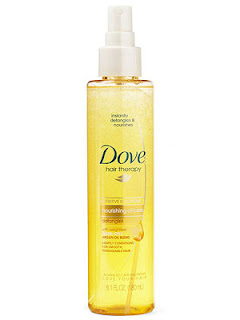 If you remember what I said about sulfates, they're great at cleansing, despite being harsh, and I have used them carefully and infrequently with this sole purpose in mind. Conditioners are almost as important as shampoo, but in a different way. 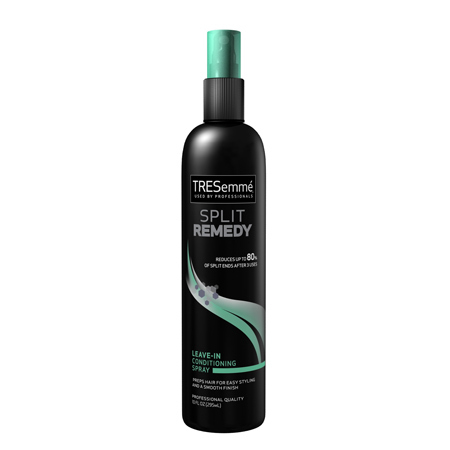 Generally conditioners work by replacing cuticle cells that have broken away and in doing so it creates a protective layer over the cortex of the hair shaft. 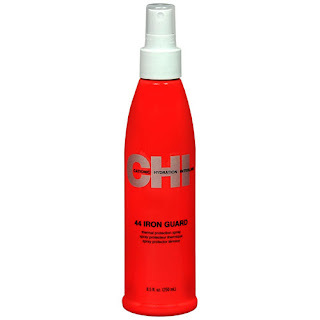 This coating smoothes down the rough edges that can cause tangles and it also seals in moisture and reduces the static electricity that causes frizz. Some of the ingredients that are commonly found in conditioners are waxes, oils and fats. I look for conditioners that have some weight - if its runny or watery, it'll do nothing for me, and tresemme conditioners are great in that way. They're also extremely affordable. As I said earlier, I use shampoo sparingly, but when it comes to conditioner its the complete opposite. I can literally fill my entire palm with the stuff and it still may not be enough. 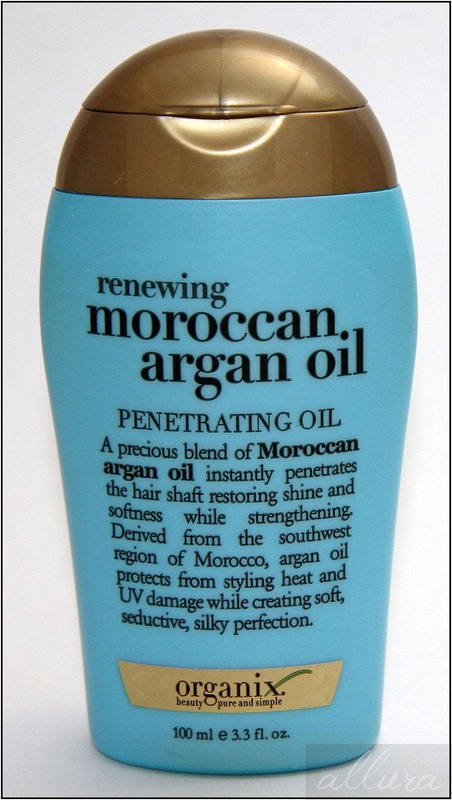 I'll apply it to my hair, heavily, from the top of my ears, down, concentrating mostly on the very ends. I keep a few cheap plastic claw clips in the shower and I use them to hold my hair up and off my back while I've got the conditioner in. This is just a personal quirk of mine - I simply dislike the sensation of it running onto my skin. Conditioner stays on for three to five minutes and then I rinse my hair in the coldest water I can stand. This is actually one of my favorite little hair tricks, and an important part of my hair washing routine. It also just plain makes a lot of sense. If you've ever taken a cold shower, you've probably noticed that when you step out of the bathroom you're not nearly as chilly as you'd be if you'd taken a hot shower, and the reason is simple. The pores in our skin tighten up to conserve our body heat, whereas when you take a warm or hot shower, they open to release that heat/energy. And the same thing rings true when it comes to our hair. Rinsing it out in cold water seals the cuticle, minimizes damage and increases natural shine. I'll admit, it takes time to adjust one's self to the cooler water, but its absolutely worth it, and for many reasons besides our hair. Click here to learn more about the health benefits of cold showers. I LOVE hair masks. 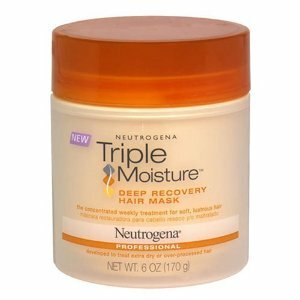 Basically they're extra heavy conditioners designed to give your hair a wicked amount of moisture in a very short period of time. Every summer I visit my family in Greece, and I'll buy 10 or 15 of these from the local supermarket and they usually last until the following year. I've found a link to these online if you're interested, as they're lovely! 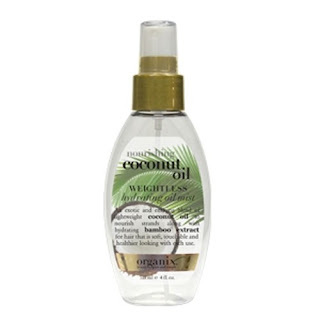 I really believe in and support this product, because for me, its nothing short of a miracle. All natural ingredients, it smells sweet and reminds me of summer and it's single handedly brought my hair back from the dead several times. 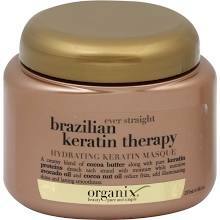 I've jokingly referred to this as "hair crack," because its so fantastic. You can use this stuff like an ordinary conditioner, a hair mask or even sleep with it in overnight for super hydration. I don't use it everyday, rather I save it for occasions when my hair needs some extra help, like right after vacations at the beach. I use a hair mask three times a week and I usually leave it in anywhere from 10 minutes to an hour. The time I can set aside for this varies from week to week, but I always get it into my routine somehow, and thats because its really worth it! 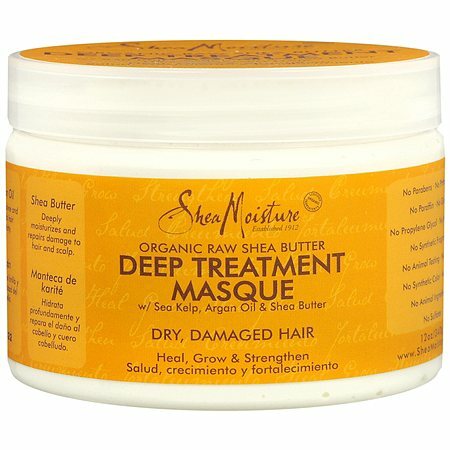 Instead of applying this from the ear down, I put masks on from root to tip, and again I rinse it out in very cold water. 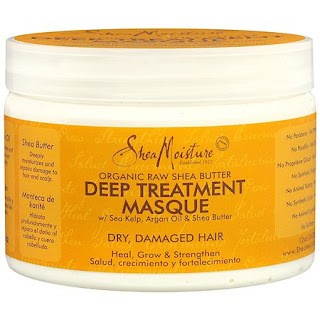 You can check out this article, "The Best Hair Masks for Healthy Locks," for more information or maybe even some inspiration! And if you're pinching your pennies right now, check out this article, "5 Homemade Hair Mask Recipes That Really Work." I use Hot Oils once a month, and mostly because they feel nice. There are a few kinds to choose from, one of which is heating it up in a microwave and then applying it onto the hair. 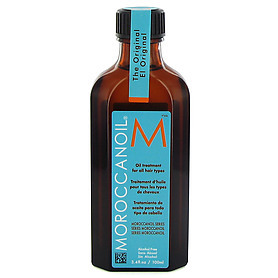 The oil saturates hair, replenishing moisture, promoting circulation, repairing damage, splits and even reducing dandruff. The brand I like, Pink, heats up right in your hand, which is really neat. 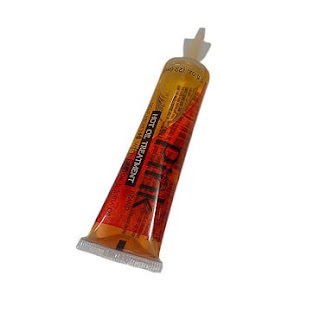 It's also pretty inexpensive, so it doesn't matter that I need three of these little tubes to saturate all my hair. As soon as I get out of the shower I'll apply one, or two, leave in products. I usually have somewhere between five and ten of these kind of things in my medicine cabinet at any given time, and I rotate them everyday. If my hair feels a little dry its usually an oil or serum, or if I feel like I want a nice smell it may be a leave in conditioner spray. I never apply more then two leave ins - I'm of the opinion that if you use more then two, the products tend to cancel each other out, not to mention leave the hair looking heavy or sticky. In this case its quality over quantity. And these are only SOME of the things I've tried! I'm constantly experimenting with different brands in various formats - while I do have a lot of hair, its very fine and so, not every purchase has been a successful one. It's definitely a disappointment when I discover that something I've been looking forward to, doesn't work for me, but where one fails, another may succeed! My only real advice in terms of these kinds of products is to take your time and go cheap. At least initially. Build up your arsenal of go-to products and then try your hand at the more expensive things. I should mention though, that for me, many of the drugstore brands have been of, or the same quality as some of the ritzy department store counterparts. I've definitely been the victim of flashy marketing in the past and its only been in the last few years that I've come to be able to discern between showy ads and substantial products. Don't forget that most drugstores, like CVS, Walgreens, Duane Reade and Rite Ad, have a pretty flexible return policy. 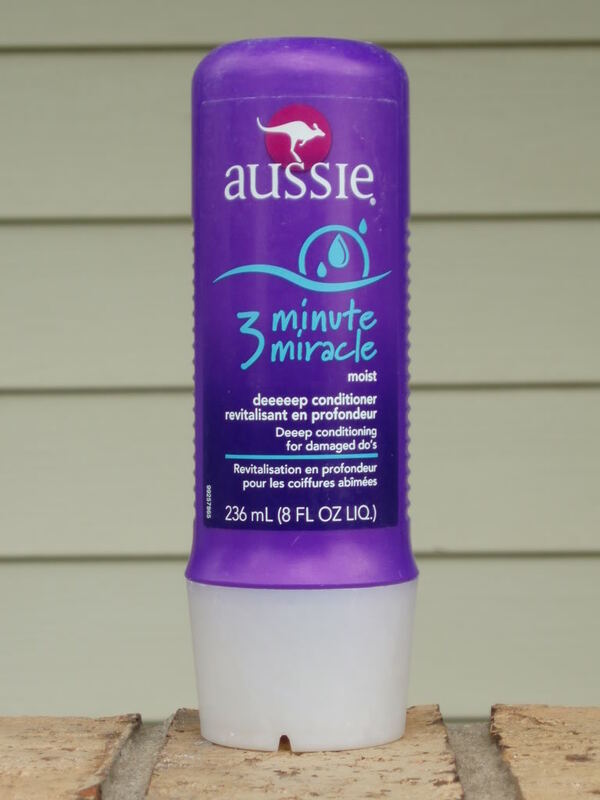 They don't really advertise this to their customers, but if you ever buy a beauty product that doesn't work for you, you can in fact, return it even if its open. After some time and practice, you'll probably find that you'll be able to tell straight away if a product is right for you, just from reading labels or looking at it. The only brush I use is the Tangle Teezer and its probably the best hair detangling tool I've ever owned in the entirety of my life! Wet or dry, this tool has been a miracle. 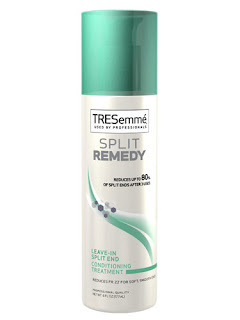 Within six months of using this exclusively, I saw less splits, damage and even less hair shed. This brush has made it possible for me to go longer between trims as well, which has obviously been helpful in growing my hair out. The only thing to consider is that the tangle teezer is disposable. They can last for six months, even a year, but eventually the teeth wear down and you'll have to replace it. But for 10-15 dollars a pop, I think its worth it. I don't really get substantial haircuts anymore. At the moment I don't want any layers and my hair goal for the last few years has been to grow it out to hip length. Instead I get small trims, usually an inch, to an inch and a half, every six months to a year. Normally I go to the salon in early September, right after summer vacation and then again in the spring, sometime between the end of March and beginning of April. Every month though, I do a thorough "Search and Destroy" to my hair. That isn't the actual technical term, just a fun way of describing a mini self trim - I've heard it called a number of things including "hair dusting" and "micro trimming." To begin, you need to invest in a proper pair of hair cutting scissors. You don't have to spend tons of money, but you do want to purchase from a reputable company. My scissors are Sally Hanson and cost about 15 dollars. 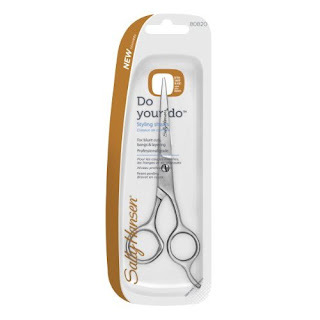 Make sure that you don't use them for anything except your hair - and definitely don't use scissors that come from the kitchen or your office. If they aren't extremely sharp, or have been dulled from usage on other objects, they'll actually contribute to more damage then good. What I like to do is divide my hair into a few sections, hold the ends up to the light and snip off any and all splits I come across. This usually takes me a good hour to do, so I'll throw a towel over my lap and flip on a movie in the background to keep me entertained. If you have a garden or backyard, you could do this outside - natural light is always better then artificial, and its a great way to avoid clean up as well! I began doing this regularly two years ago and I've found that its really helpful in maintaining happy ends. 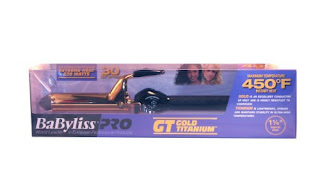 When I first began to grow my hair out I decided to forgo all of my curling irons and hair dryers. I'd read over and over again how unhealthy heat tools were, especially on long hair, and my thought was that by giving them up I'd be able to minimize, if not reverse, the damage that they'd caused me in the past. The only real problem with my plan was that it was November. In New York City. And I wash my hair everyday. I couldn't very well go outside with wet hair, so I took to washing it in the evening, braiding it and hoping for the best in the morning. A few months into this torturous boycott, I wanted to film a video that required the use of a curling iron. 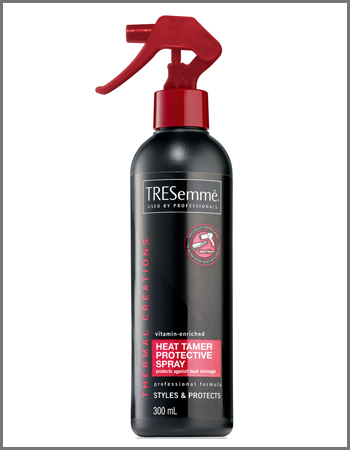 I danced around it for a few days before caving into my heat tools addiction and of course, nothing terrible happened. It was then that I decided that within moderation, there's nothing wrong with a flat iron or a crimper. This doesn't mean that you should ever neglect using a heat protectant though. Many viewers have asked me why I don't make more of a show of it in my videos, and I think its because its such an obvious step to me. 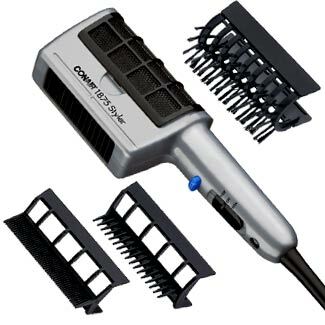 When it comes to heat tools, I've bought everything from the super cheap, to moderately priced, to wildly extravagant. 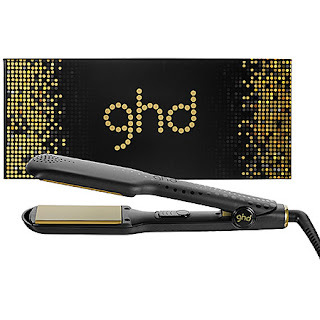 In my early 20s I splurged 200 bucks on a fancy GHD flat iron in Sephora. I read that it was the best out there, and since I was in the middle of my hipster phase, I didn't care how much the straight hair was going to cost me. In retrospect this is a pretty fantastic tool, and years later I still have occasions to use it. I've been using the same hair dryer for years. My Aunt Ellen bought me my first one, back when I was only 12 years old! Can you believe that this make and model has been around for that long? It's super easy to use, extremely cheap and feels like an old friend. Because I've been using it so long it reminds me of childhood and some of the women in my family, which is why I probably continue to purchase it. There are definitely nicer versions to select from out there, but for now, I can't break my own hair tradition. They seem to last a full year before dying and at about 30 dollars a pop its no big deal to replace them. I'll admit, I should probably update this area of my routine, but the sentimental part of me is not yet ready for it. As far as curling wands go, these are quite nice, and reasonably priced. I've never had a problem with it and would certainly recommend one of these to a friend. 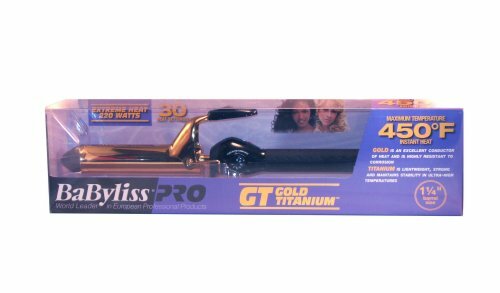 In fact, its been my experience that most Babyliss hair tools are effective and good quality. Reserve using your curling iron for special occasions and try to refrain from daily usage. It's always a good idea to give your hair a break from any kind of heat tool, especially those that change the natural shape of your hair. Never hold a curling iron on your hair for more then 5-10 seconds and try to use the lowest heat setting you can. Here's a video I did awhile back on creating curls. * One of the worst things you can do to your hair is tease it! The outer layer of your hair strands, the cuticle, point downwards, so when you comb or brush in the opposite direction you're basically pushing the cuticle back, creating tiny ruffles. The next time you brush, you'll slough those scales off, exposing the strand's inner layers. This eventually leads to serious breakage and split ends, so while it may be fun to pump up your hair's volume now, you'll more then likely regret it in the future. * Another thing I never do is brush my hair from the roots down. When detangling, I always begin at the ends first, and then work my way up to the top of my head. Not only is this less painful, there's almost always less shed and breakage. * I'll never use henna hair dyes. Besides being a professional colorist's nightmare, it isn't any safer or natural then highlights or chemical coloring treatments found in salons. Henna is a plant cultivated in India and Northern Africa - the leaves contain a red orange dye called lawsone and to produce the dye, the leaves are dried and mixed with oil and water. There's a misconception that henna, found in a array of colors, is natural hair color, when actually the only natural shade it produces is the red orange stuff. To turn it into differing colors other dye plants, chemicals and metallic salts must be mixed in with it. The most commonly used salt is lead acetate, however silver nitrate, copper, cobalt, bismuth and iron are also used to alter henna. Worst part is, if you ever get sick of your henna color, or want a change, its virtually impossible to remove. Compound henna reacts very unpredictably with peroxide (which is usually used to strip unwanted color) and it can turn your hair purple, green, dark yellow or simply burn or disintegrate. If you're looking to make a big change with your hair color, my advice is to find a salon and professional colorist that you like, and discuss it first. I hope you found some of my routines and opinions helpful! Please feel free to contact me on my Facebook page, should you have any questions! Daenerys Targaryen "Pyre Scene" Braid. Back in 2011 I made this annoyingly long hair tutorial for that fancy Daenerys braid that everyone was in love with after Game of Thrones, Season 1 ended. I'd been on youtube for a little over a year, and was eager to please my subscribers with what I was positive would become a hugely popular hairstyle in the beauty community. This was only the second or third time I'd tried this out, the first being the previous day. I'd been so enthralled by the climactic and epic ending of Episode 10, that I didn't look as thoroughly at her hairstyle. I mean, with dragons hatching, witches being burned in sacrificial burial pyres, and beautiful heroines escaping dangerous fires unscathed and unclothed, why would I have? To my surprise the video, which admittedly is way too long (and features a very shy, yet garrulous me), became, and continues to become, one of my most viewed. Well this and the "how to use a tampon" video. Having very little experience with "vlogging" AND only moderate practice with braiding and hair styling at the time, I've thought about updating this famous braid in a video for several months. 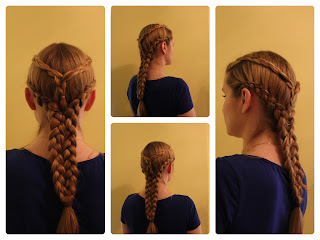 Every once in awhile I go through a couple of weeks of what my husband jokingly refers to as "hair block," and then just as I'm about to get down to it, I'll immediately see a style that catches my eye and puts the old Pyre Braid back down on the bottom of the list. That changed a couple of days ago, when I forced myself to film this. I'm quite happy with this new version, and its not just because the new video is a whole ten minutes shorter. I've just learned so much more in between then and now, and I'm happy to say that I feel quite content with this rendition! So whats different between the old and new? 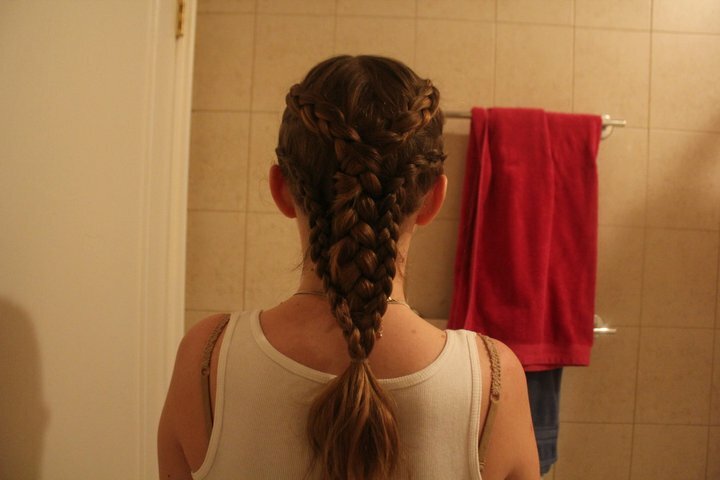 In the old version I split the hair into several sections and dutch braided them. Thats it. I had three braids in the "tail" of this hairstyle, pinned together. I'll admit that I still do like the way this can look, even if its not as spot on. 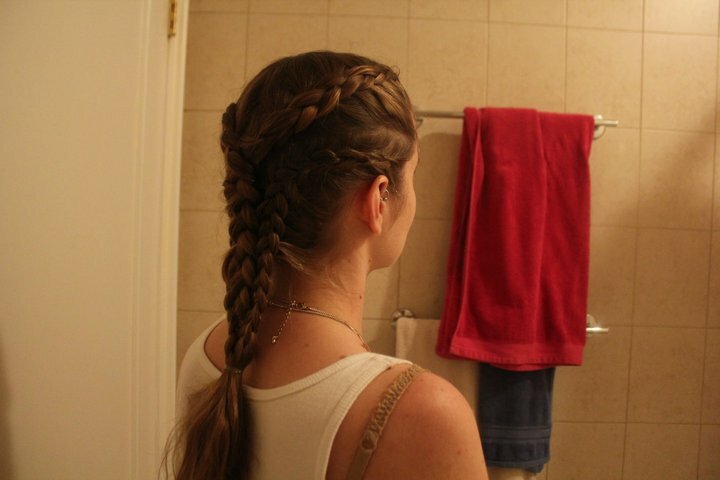 In the newer version, I made regular hippie braids on both sides of my head, then braided those together, and used the bottom half of my hair to make dutch lace braids (lace braids are like french braids but you only add hair into the braid on one side). This time I had TWO braids in the "tail," although I used the same method of bobby pinning to hold them together side by side. Having re watched the episode several hundred times I'm almost positive that they must've used some sort of thread to sew them together, and maybe the next time I do this I'll try it like that myself. My inner Khaleesi is sated. For now. And at least until the next GOT braid is revealed and I have another hairgasm. Five Minute, GOT Inspired, Season 3, Hair Ideas: Missandei, Sansa and Margaery. Just a few pictures of my recent hair ideas, inspired by Game of Thrones! Links for all the Products Mentioned in my Recent HairCare and Routine Video!! She's so great, check her out if you haven't already! What a horrible idea. Of course everyone who watches youtube should take some of what they see, hear and learn with a grain of salt. If someone is lying AND trying to take your money in a deceitful manner, then of course something should be done to expose the problem (isn't that why we have the police, FTC, etc?...). With that said, I have to admit though that I'm not sure I could ever feel sorry for someone who doesn't do research on products and/or plain just doesn't use their god given common sense. Do you THINK its a good idea? Does that SEEM like something you'd pay for? Sheesh. I've watched Michelle Phan for years (she's the biggest one they complain about, hence the reason I use her as an example). My husband was actually the one who showed me her channel, and we've always thought she was creative and funny. Sure, there are times when I think she's a little pushy with marketing herself, or the products she is now endorsing, but when I don't like it I watch something else. It takes under a second to click into another video. I can't understand watching something you don't like for how ever many minutes, then using energy to come up with something witty and snarky to say, AND THEN logging into a forum, full of strangers who only care about the witty and snarky things that THEY are writing themselves, and THEN post hateful comments. Where's the commaraderie amongst women? Do we really all hate each other like this? Its kind of terrifying to me actually. If I had thousands/millions of subscribers and views, I'd probably want to try and make a living from my videos too. So would you. So would anybody. I've been thinking of starting an etsy store and selling some of my handmade wares and then telling whatever audience/friends I have, about it in a video. Does that make me bad? Am I swindling my viewers? I hadn't thought so before, but now I'm not so sure. I've read tons of the threads on the site and what I don't understand is why there are so many "cruel" things written. "She's fat. Annoying. Ugly. Needs to get punched in the face so she'll shut the #$%^ up." I hate when I hear, "well she/he put herself/himself out there on the internet. What did she/he expect?" Everyone sits behind their keyboards anonymously, and judge, but the truth is, you wouldn't approach someone you didn't like on the street and start randomly threatening them, hurl slurs at them, or use crude and inappropriate sexual remarks to try and bait them into an altercation. Passerbys would think you're a whacko, the cops would be called and you'd probably get hauled to jail for the weekend. How come the rules of common decency don't apply on the internet? Its really pretty terrible. Doesn't anyone read the paper or watch the news? Children have killed themselves over terrible words that have been published about them on the internet. I think each and everyone of the girls/women who have been "trashed," on gurugossip.com, should sue. Either sue the forum, or ban together in someway to have it shut down. Thats enough ranting today. I'm tired. Good Discount Site for Beauty Products!